Only in L.A. can you have your haute cuisine next door to a fluff and fold. That’s right. We’re talking great chow in strip malls. We all have our secret places. But have you been to Lou yet? Lou on Vine is oh so fine. But how the heck do you spot it? It’s on the corner of Vine and Camerford, just north of Melrose. 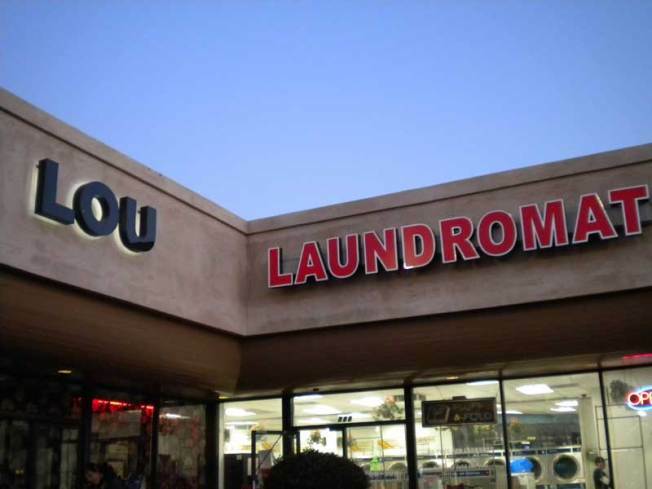 Look for the sign that boldly says LAUNDROMAT, and whispers Lou diminutively. After you’ve parked just look for a door with an A on it and you’ll know that’s the one that will lead you into this cozy/hipster hangout that manages to pull off ambiance by completely shutting out the outside world. Any restaurant that boldly puts Pork Candy at the top of their menu can’t be bad. If you love bacon (and how can you not) this is a must-get. Now move on to on of their tasty salads. Then how about a country-style pate with pistachios? The black lentils with chorizo and fried egg are delish and original. Finish up with a Valhrona chocolate tart? And let’s not forget the wine, folks. One of the great things about Lou is that they offer a broad selection of truly hand-picked wines and even offer them in ½ glasses if you wish so you can pair every single course you have with a different wine if you choose! Let your server guide your wine journey. I usually steer clear of chardonnays, but my server pointed out a French one that was dry and crisp – nothing like a California chard – and it was only $4! Is this a dream? Nope, it’s Lou. Where to next? Drop me an email at eataround@gmail.com .